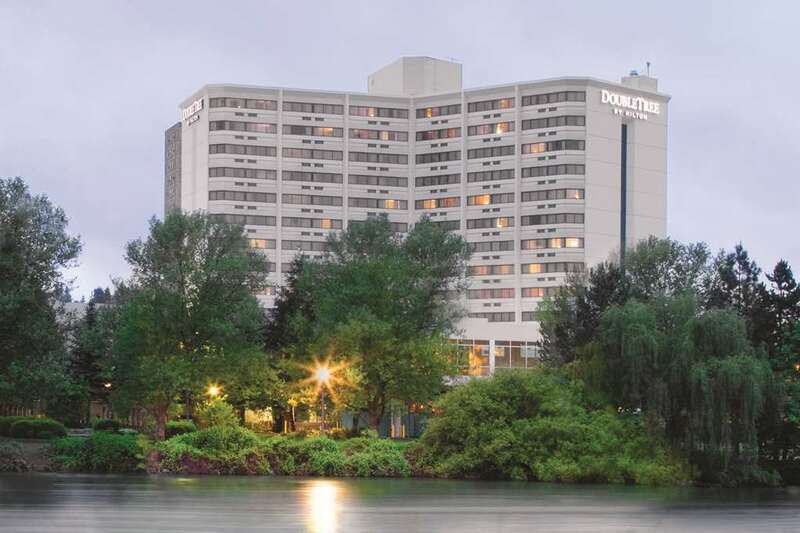 Located in the heart of downtown Spokane our hotel sits on the banks of the Spokane River and next to the Centennial Trail. We are all about convenience at our hotel. If coming from the airport you will appreciate we are a quick fifteen-minute shuttle ride from Spokane International Airport /GEG/. If you*re driving in you*ll enjoy the benefits of the covered parking garage and if you*re attending a meeting at the Convention Center there*s a sky-bridge that allows you to quickly walk from your hotel room to the center. When staying with us be sure to enjoy all of our features 375 guest rooms including six suites. covered two-level parking garage /for a fee/. complimentary standard wireless internet for our Hilton Honors guests. Spencer*s for Steaks and Chops one of the highest rated steakhouse in the Inland Northwest serving aged hand cut prime beef with an unmatched selection of wines from all around the globe and of course from Washington. Shutters Cafe starting your day right with our buffet breakfast and Starbucks coffee. Once you are ready to get out and see the city you can be confident you chose the hotel with the most convenient location. DoubleTree by Hilton Spokane City Center is within walking distance to numerous attractions including the Centennial Trail 100-acre Riverfront Park gondola Skyride over the Spokane Falls our cities 1909 Looff Carrousel ice skating in the winter and an interactive fountain in the summer. For the arts lover we*re less than one block from the INB Performing Arts Center featuring the Best of Broadway series and special events. The hotel is also within easy reach of the Spokane Arena - Home of Spokane Chiefs hockey club Silverwood Theme Park and Boulder Beach Water Park - The Northwest*s largest theme park with over 65 rides Avista Stadium - Home of the Spokane Indians minor league baseball team and spectacular valley and mountain views await you at one of the area*s many public and private golf courses. In Room Dining: For the times you just don*t feel like going out enjoy the great food and excellent service you would get in a restaurant in the comfort of your own room. Spencer*s Lounge: Located on the lobby level offering a full bar stocked with local and regional wines on tap and bottled beer and fine spirits. Open for lunch and dinner. Happy Hour from 4pm - 6pm daily. For more information please call /509/ 744-2372.